Take in aerial views of the UNESCO World Heritage-listed Québec City and Montmorency Falls on this 30-minute helicopter tour. As you fly over Orléans Island, Le Château Frontenac, the Plains of Abraham, and Old Québec, listen to commentary from your pilot/guide in English or French. Pickup and drop-off at downtown Québec City hotels available. Make your way to Jean Lesage International Airport at your chosen departure time; flights are available between 10 a.m. and 4 p.m. Shuttle service is provided from downtown Québec City hotels upon request. Met your pilot and, after a safety briefing, climb in to your state-of-the-art helicopter. Buckle your safety belt and don a headset, through which you will listen to the pilot's commentary in English or French. 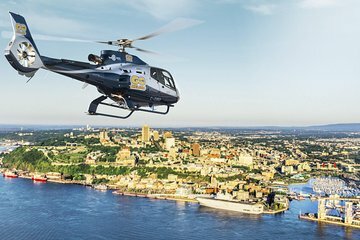 Take off and spend the next 30 minutes flying over the UNESCO World Heritage-listed Québec City's highlights and landmarks. Get aerial views of the city's bridges, the Old City, the Plains of Abraham, and the Château Frontenac. Fly over the St. Lawrence River on the way to the Île d’Orléans, an agricultural center dotted with charming villages. The tour's last sight is Montmorency Falls, on the Beaupré shore, spilling over in an impressive 272-foot (83-meter) cascade.